• Cauliflower florets - 3 cup. • Green chilli paste - 1 tea spoon. • Spring onions (chopped) - 1/2 cup. • Capsicum (chopped ) - 1/4 cup. • Garlic (chopped ) - 2 no. • Soya sauce - 2 teaspoons. • Tomato ketchup - 2 teaspoons. • Chilli sauce - 1 tea spoon. Cook cauliflower florets in salted water for 5 minutes and remove the water and keep aside. Add ginger garlic paste, green chilies paste, salt and water to all-purpose flour to make a batter of medium consistency. Dip the florets in the batter and deep fry in hot oil until golden brown and remove and drain. Heat 2 teaspoons of oil in a skillet and sauté spring onions, garlic, and capsicum for 5 minutes. Add soya sauce, chili sauce, tomato ketchup and cook for 2 minutes. Add the florets, mix well and cook for 5 minutes. If gravy is required, add 1 teaspoon of corn flour mixed with water (1 cup) without any lumps before adding the florets. Cook for 5 minutes then add the florets. Delicious Gobi Manchurian is ready to Serve. 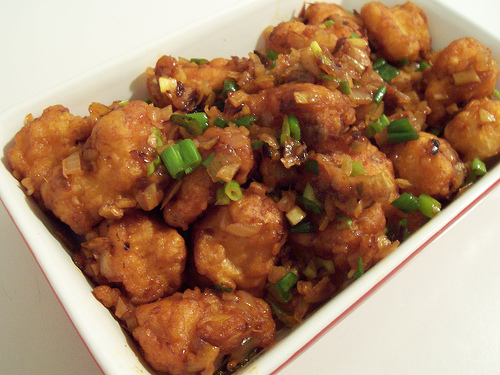 Gobi Manchurian is a very popular Indochinese dish. This snack is one of the most favorite dishes to many kids and elders too. The vegetable Manchurian recipe is probably the handful of dishes enjoyed by all ages group in the family whether we are referring to the kids or grandparents. Although people do not usually like cooking for a really long time specifically when they've other stuff to do; how... Read More.. There are two distinct variations of gobi Manchurian, dry and with gravy. The two variations are prepared through the use of common ingredients like cauliflower, corn flour, all-purpose (maida) flour, spring onion, capsicum, soy sauce, chili sauce, chopped garlic, ground pepper, etc. and contains typical garnish of spring onion. Few tasty recipes require using of Ajinomoto to boost the flavor, although some people might avoid it because of myths about its unhealthiness. Its flavor may differ from mildly spicy to sizzling and hot depending on the recipe and individual preference. For the hot sauce (gravy) heat oil in the pan. Add garlic, ginger, celery and serrano pepper. Sauté and add soup, soya sauce, tomato paste, agave or maple syrup, rice vinegar, chili paste, and pepper. Simmer and stir often. Stir cold water and corn starch together. Add to gravy mixture and stir to add in. Cook it until gravy get become thick. Please tell me which soya sause should be used. Hi Sanjay, Please post a video on Gobi Manchurian. Thanks A lot for this web site.. Really helping us. wat is all purpose flour?